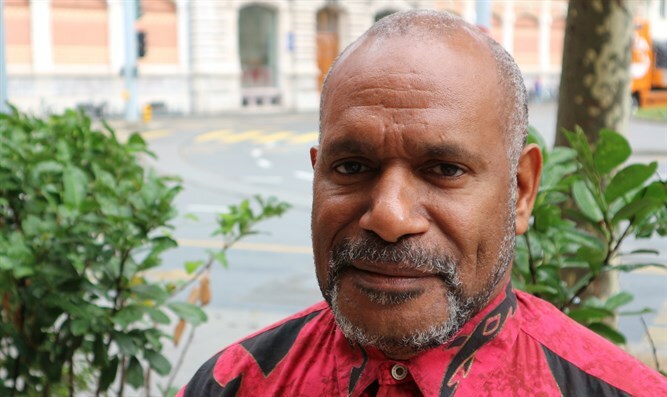 Exiled leader Benny Wenda smuggles petition to Decolonization Committee. UN: Indonesian takeover of province not on agenda. The UN’s Decolonization Committee rejected a petition signed by 1.8 million West Papuans calling for independence, saying West Papua’s cause is outside the committee’s mandate, reported The Guardian. "In the West Papuan People's Petition, we hand over the bones of the people of West Papua to the United Nations and the world. After decades of suffering, decades of genocide, decades of occupation, today we open up the voice of the West Papuan people which lives inside this petition. My people want to be free," reads the text of the petition. Exiled West Papuan leader Benny Wenda presented the petition in New York on Tuesday. The document was banned by the Indonesian government but smuggled across Papua and reportedly endorsed by 70% of the contested province’s population. It was submitted to the UN’s Decolonization Committee, known as the C24, responsible for monitoring former colonies' progress towards independence, the Guardian said. Wenda reacted to the UN rejection: "This week I delivered a petition signed by the majority of West Papuans to the United Nations, calling on the UN to act over human rights abuses in West Papua and to carry out its 1962 commitment to ensure West Papuans have the opportunity freely to exercise their right to self-determination. "This petition is more than just paper. These signatures are the bones and blood of my people who have been killed and who have suffered; and who continue to suffer and die under Indonesian occupation. This petition was presented with tears in my eyes and hope in my heart as I handed over the spirit of my people, people who have struggled and died for over 50 years, in a neglected genocide for the world to finally hear their voice. "I personally delivered the 1.8 million voices of my people to a senior representative at the UN, in the presence of my fellow United Liberation Movement for West Papua leader Rex Rumakiek and my lawyer who advises the movement. I have also communicated it to the Secretariat of the Decolonisation Committee and the Special Political and Decolonization Committee (Fourth Committee) of the General Assembly, with a request that the UN review the situation of West Papua. 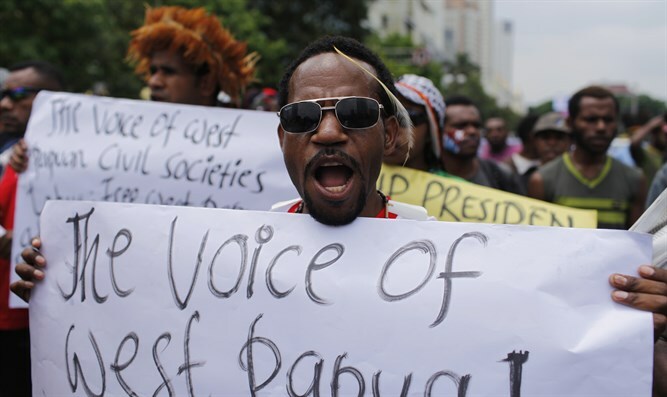 "Suggestions by Indonesian officials that the petition is a hoax or that it was not delivered to the UN are baseless and part of the continuing smokescreen of disinformation aimed at denying the West Papuan people their inalienable rights," wrote Wenda. Israeli Foreign Ministry Spokesman Emmanuel Nachshon declined to comment when asked by Arutz Sheva whether Israel has a position on West Papuan independence. The Guardian contacted the Chairman of the Decolonization Committee, Rafael Ramírez, who is Venezuela’s representative to the UN. Ramirez told the paper his office was being “manipulated” for political purposes. Ramírez did not say the petition had not been presented to the committee, only that the committee was not able to accept it. Wenda writes, "The Petition is an unprecedented effort of mass mobilisation by my people, conducted and delivered to me at great personal risk – under threat of violence, arrest and torture. I have carried it with me on every journey I have made since I received it, including to UK parliament, to the UN in Geneva and in New York. I have shown it to everyone I have met, including political leaders, friends, and UN delegates. "The West Papuan Peoples Petition is an unprecedented democratic act demonstrating the will of my people for self-determination. It was signed by 1,804,421 people: 1,708,167 indigenous West Papuans and 96,254 Indonesian settlers. The number of indigenous signatories represents an estimated 70.88% of the indigenous population of West Papua according to the latest independent research. "This shows to the world what would have happened in 1969 if we had been given the free and fair vote promised to us by the UN and to which we are entitled to under international law. 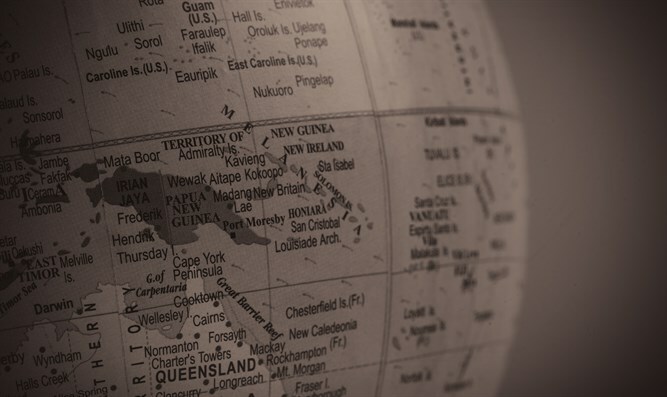 "West Papua would have been the first independent Melanesian state – before Papua New Guinea, Solomon Islands, Vanuatu, Fiji and Kanaky/New Caledonia. "Instead, West Papua was taken off the Non-Self Governing Territories list, placed under UN administration and then Indonesian administration with the stated requirement that we would be given a free and fair vote for self-determination. Indonesia knew it had obligations to us and to the international community to give us a vote where all Papuans would have a say. "Instead, Indonesia hand-picked 1,026 people and forced them to vote under threat of violence – and then told the world that my people had voted to join Indonesia. This is the real hoax," wrote Wenda.